The photo on Tuesday was a preview for this post. 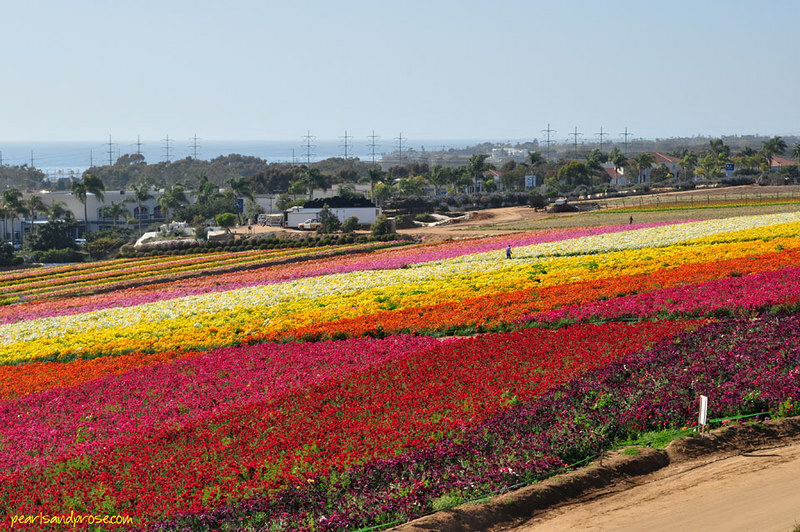 It was taken at the Flower Fields in Carlsbad, which is a beach town about 35 miles north of San Diego. 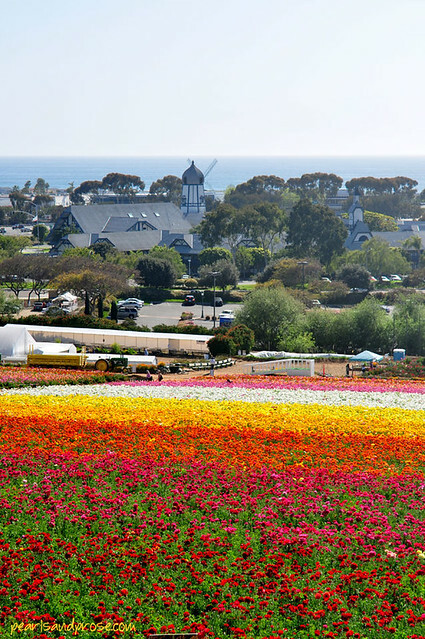 Every year, these fifty acres bloom with Tecolote Giant Ranunculus. . . .
That’s the Pacific Ocean in the background. The thing that looks like a windmill? It used to be a restaurant called Pea Soup Andersen’s, but now it’s a TGI Friday’s. A few more errant blooms. There aren’t many! I sometimes wonder if workers move the strays. 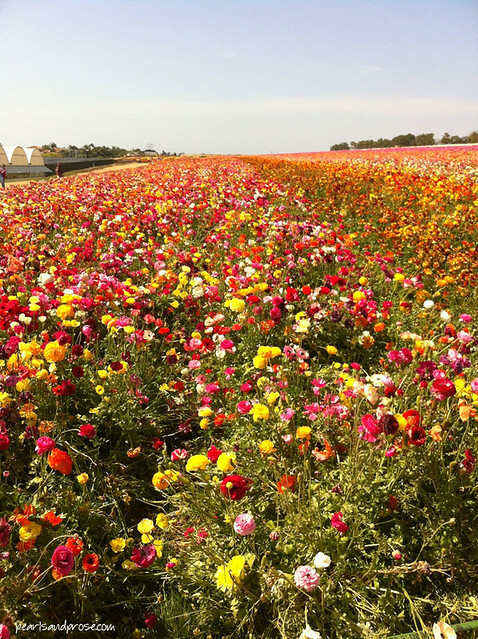 You can read the history of the flower fields here. This is a so-so iPhone shot, but I included it because I think it gives a sense of how big the area is. As you can see, there are multicolored sections, and bands with just one color. It’s been a long time since I visited the fields, but I think they used to do just the solid bands. 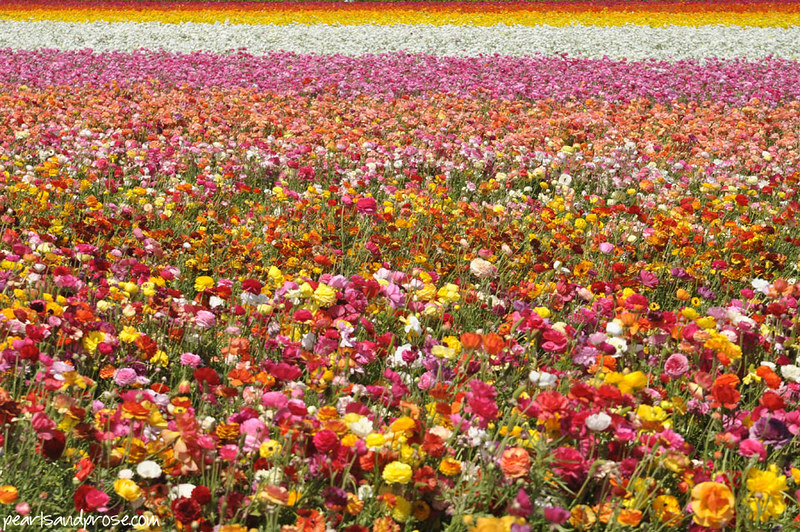 According to a brochure about the fields, there are thirteen colors: red, gold, pink, yellow, orange, white, rose, salmon, picotee, café, purple, flame and merlot. “Picotee” means having pale petals bordered by a darker color. I’m kind of partial to the salmon color. How about you? 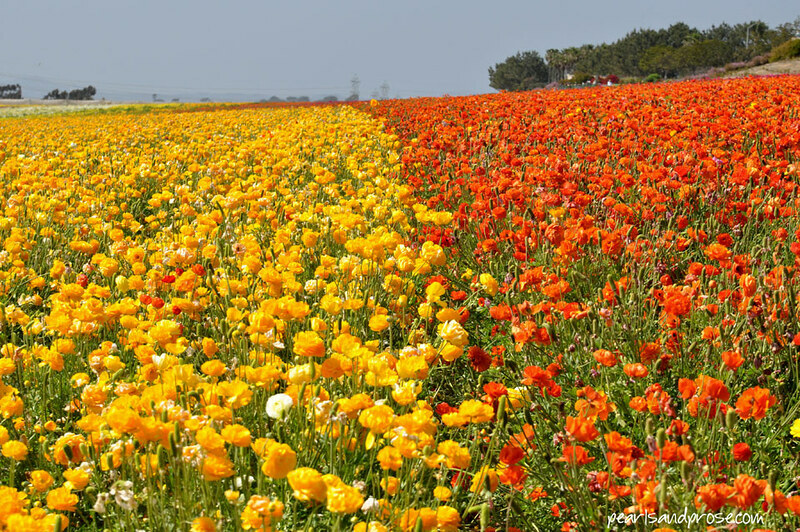 This entry was posted in photography and tagged California, Carlsbad, flower fields, ranunculus. Bookmark the permalink. Thank you, and welcome to the blog! I’ve never seen fields like that. Amazing. 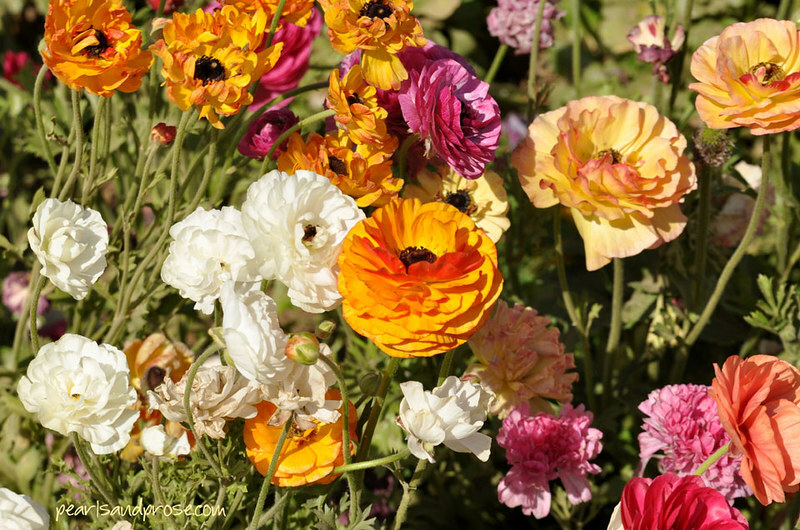 I love the multicolored ones but for the individual flowers, yes, salmon is lovely. Taking photos made me appreciate them even more. 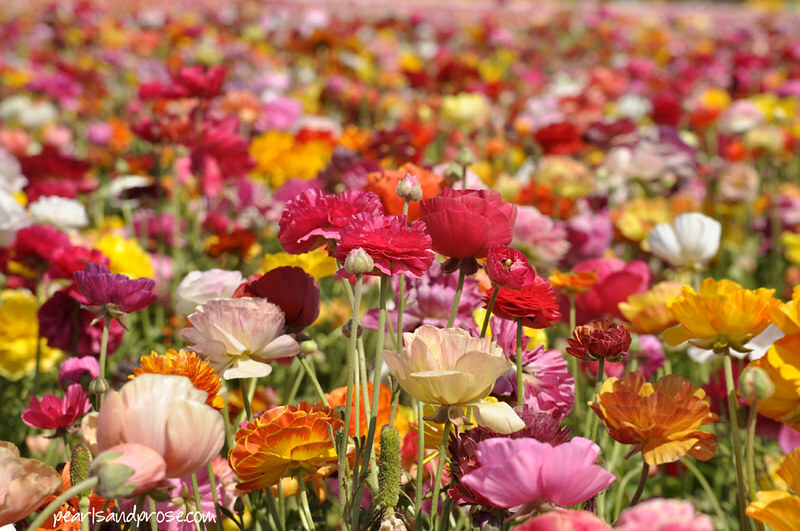 So many flowers, and the fact that they only bloom once a year makes them pretty special. They were known for their pea soup (naturally) and the food was better than Friday’s. The latter is a chain over here and has gone from OK to mediocre in my opinion. I had to laugh when you mentioned Pea Soup Andersons. I ate in one when we were driving along the coast highway a few years ago. My friend said there aren’t many of the restaurants left any more. It reminded me a bit of Cracker Barrel in the South – same kind of fun kitsch. I didn’t realize it was a chain! The last time I ate there, it wasn’t very crowded and most of the people were senior citizens. I think the place closed pretty soon after that. Oh they are wonderful. Really superb! And they turned Pea soup Anderson’s into a TGIF!!!! Oh no!!!! I remember going there once when I was a kid. Hey, thanks! Yes, it’s true. I think Friday’s has been there since 2003 at least. Now I’m wondering if the windmill in the movie Sideways was a Pea Soup Andersen’s. I was trying to remember if it was a chain since I can’t remember why I was at this one with my friend’s family. I just remember being at the restaurant and at the time I refused to eat anything with peas in it. Now I love Pea soup and wish I could go back and try it. I think I sat at the table and pouted. Wow I was a brat. How embarrassing. I always liked peas, but thought onions were disgusting. Now I love them! Pea soup is kind of unappetizing when you’re a kid, so I don’t blame you. I would like a bouquet of this in my living room. Kind of wish I’d bought a plant when I was there, but I’d spent two hours shooting in the sun and was ready to be outta’ there.